This is our 400th Recipe for the Day!!! Sorry it took a week to get it out - we have been really ill! This cake was said to resemble the Opera in Paris. It is a lot of worth, but really is worth the effort. 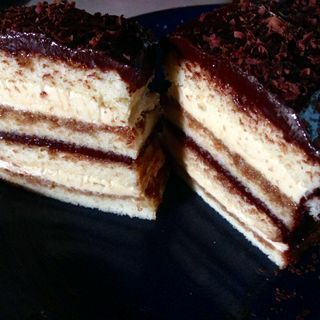 You are basically making a sponge, a coffee syrup, a creme de beurre and a ganache, then layering. Heat the water in a pan and then add the other ingredients, leave to cool. Put the sugar and water in a pan and carefully bring to a boil to create a syrup, which you then allow to cool for a few minutes. Pour the syrup into the egg yolks while whisking and then add the butter, little by little. Lay one slice on a platter or serving plate and brush some of the coffee into it.